Versatile caring oil for exceptionally soft, radiant haircolour. Offering the utmost respect to colour-treated hair and the environment, Precious Oil contains 100% biodegradable ingredients and is a paraben-and silicone-free formula, earning it the prestigious Green Seal™ certification. PRE-SHAMPOO: Apply 1 to 2 drops on dry hair. Follow with any Pureology shampoo, lather and rinse. LAYERED BEFORE CONDITION: Apply 1 to 2 drops to damaged hair after shampooing. Layer any Pureology condition on top. Leave on 1-2 minutes and rinse. LAYERED BEFORE MASQUE: Apply 1 to 2 drops to damaged hair after shampooing. Layer any Pureology masque on top. Leave on 5-10 minutes and rinse. LEAVE-IN: Apply 1 to 2 drops to the mid-lengths and ends of dry or damp hair. 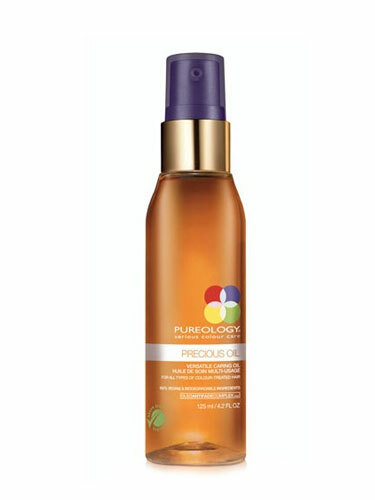 MIXED WITH STYLING PRODUCTS: Blend or layer 1 to 2 drops with your favorite Pureology styling products. Style as usual. OVERNIGHT TREATMENT; Apply evenly through hair before bed. Leave in or rinse out in the morning. DAY-2 REFRESHER: Apply 1 to 2 drops in palms and run through hair. SKIN SOFTENING: Apply to clean skin and massage in to moisturize.